GOP presidential hopeful Ted Cruz is expected to announce this morning in Houston that he has secured the endorsement of Lt. Gov. Dan Patrick, the biggest get yet for the Texas senator in his home state. As the Tribune's Patrick Svitek wrote over the weekend, the lieutenant governor is "arguably the most powerful elected official in Texas and the third statewide official to back Cruz. Patrick will serve as the Texas chairman of Cruz's campaign. "The endorsement marks a reconciliation of sorts between Cruz and Patrick, both darlings of the Tea Party in Texas. In the 2012 election that sent Cruz to Washington, D.C., Patrick, then a state senator, was allied with Cruz's opponent, then-Lt. Gov. David Dewhurst." Svitek also reported that Cruz would announce the addition of six former Perry donors to his finance team. The list is led by Dallas billionaire Darwin Deason. "Other former Perry donors now backing Cruz include Deason's son Doug, Cinemark founder Lee Roy Mitchell and his wife Tandy, Houston investor Jim Lee and Dallas tax consultant Brint Ryan." Brady Eyeing Ryan's Committee Chairmanship, by Abby Livingston – U.S. Rep. Kevin Brady, R-The Woodlands, is expected to announce Monday whether he will will attempt to succeed U.S. Rep. Paul Ryan as chairman of the U.S. House Committee on Ways and Means. Emails: Prosecutors Got Texas Mutual "Great Publicity", by Jay Root and Tony Plohetski, Austin American-Statesman – Travis County prosecutors say the money they get each year from Texas Mutual to prosecute workers’ compensation fraud helps consumers. But in internal emails, they readily admit they’re generating cash and publicity for the insurer. Official: Actions Against Planned Parenthood Are Not Final, by Ross Ramsey – In an interview Saturday, the Texas official in charge of the Medicaid inquiry of Planned Parenthood said that the organization has not been terminated from that federal health care program and that it will take at least a month to determine whether it should be. As Bush Stumbles, Cruz Camp Boasts of Momentum, by Patrick Svitek –With 100 days to the Iowa caucuses, Ted Cruz's presidential campaign is offering a confident outlook on his long-term viability, heartened by expectations-busting fundraising and a far-reaching ground game. Jeb Bush to Rally Top Donors in Houston, Seek More Cash, by Patrick Svitek – Jeb Bush's presidential campaign is planning a major fundraising push next week in Houston that is expected to include three generations of his famous family, including Land Commissioner George P. Bush. Texans to Decide on Transportation Funding with Prop 7, by Luqman Adeniyi – As Texas' transportation needs multiply, voters in the rapidly growing state will be asked Nov. 3 to consider a way to pay for those needs. Analysis: Shooting First, Asking Questions Later, by Ross Ramsey – If Planned Parenthood has been billing Texas Medicaid for services it hasn’t been rendering, it makes sense to cut off the money and go after the organization for whatever it stole, but it does seem like you would do the investigation first. Texas Part of Coalition Suing EPA Over Clean Power Plan, by Kiah Collier – As promised, Texas is suing the U.S. Environmental Protection Agency over President Obama’s plan to combat climate change, Attorney General Ken Paxton announced Friday, just after the new regulation had been finalized. • Ted Cruz and Lt. Gov. 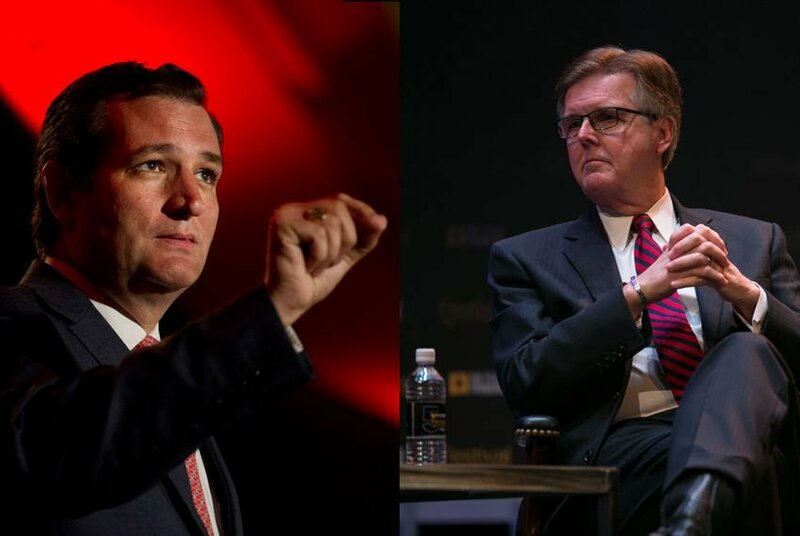 Dan Patrick will be in Houston this morning where the two plan to announce Patrick's endorsement of Cruz for president. The announcement will be made at the Cruz for President Campaign Headquarters. "One more liberal justice and our right to keep and bear arms is taken away from us by an activist court." –U.S. Sen. Ted Cruz, who is also running for president, on how he would handle appointing justices to the U.S. Supreme Court. Equal rights ordinance reflects Houston's progressive values, by Guthrie Graves-Fitzsimmons – In a few weeks, my Hometown pride will be tested by the Houston Equal Rights Ordinance being put to the ballot box. As someone who defends Houston’s progressive values in the midst of deep red South, I hope and pray that Houston votes YES to Hero. • A discussion about Public Education: The Next Five Years on Nov. 13 at the University of Texas at El Paso. Correction: This story initially included Kelcy Warren and Roy Bailey on the list of former Rick Perry donors who were expected to be added to the Ted Cruz finance committee, but the Cruz campaign said Oct. 26 they included those names on the list in error.